This month’s sculpture from Hadrian’s Villa is a marble head of Antinous, one of the ten marble images of Antinous found there. This portrait of Antinous is conserved in the Palazzo Massimo alle Terme in Rome. It is related to a coin type minted in the city of Adramyttium in Mysia (modern Edremit, Turkey) by an individual called Gessius (his name appears on the reverse of the coin). The coin was struck with the head of Antinous on the obverse and the words ΙΑΚΧΟC ΑΝΤΙΝΟΟC (Iacchos Antinous). Antinous is portrayed as Iacchos, a minor Dionysian deity (also epithet of Dionysus) associated with the Eleusinian Mysteries (Hadrian first took part in the Mysteries in about 124 AD and again in late summer 128 AD together with Antinous). The British Museum holds such a coin with the Eleusinian goddess Demeter on the reverse. 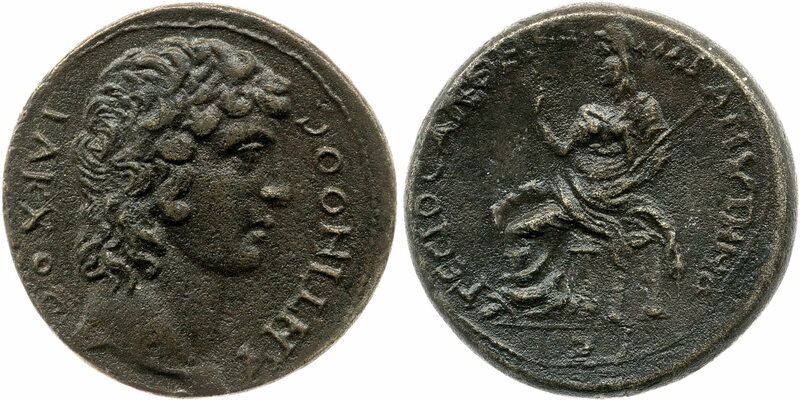 Gessius’ inclusion of his own name on the reverse of the coin shows how the provincial elite members sought to identity themselves and their cities with the imperial cult. T. Opper, Hadrian: Empire and Conflict, The Antinous Cult, p. 188-190.